I was born in 1953 and I am originally from the Saar region. For 20 years now I am a resident general practitioner specialized in methods of natural healing, acupuncture and homoeopathy in Hannover (Germany). During my specialist training as a doctor for natural healing methods, I learned both autogenic training and the technique of hypnosis alongside with getting the opportunity for an introduction into the art of breathing by Ilse Middendorf. Authorized for specialist training by the German Medical Association (Ärztekammer), I instructed young colleagues in my own surgery as well as acting as chairman of the professional organisation of medical natural healing practitioners for several years. During some long-term stays in Peru, I got the chance to get to know the local practice of herb medicine while being introduced into the practice of shamanism by the practitioners themselves. Already in early youth I got involved with Buddhism, an engagement that lasts to this day. Important impulses that formed my understanding came from the works, the advice and the initiations of Chhimed Rigdzin Rinpoche and the 14th Dalai Lama. My first steps into the world of Qigong were accompanied by Dr. Josephine Zöller (Berlin). In 1988, I met my main teacher of Qigong, Prof. Jiao Guorui from Beijing. With him I have learned the art of Qigong in China and Germany until his death in 1997. In the process, the experience I had gained in long years of Asian martial arts training proved to be very helpful. In 1991, the Medical Society for Qigong Yangsheng (Medizinische Gesellschaft für Qigong Yangsheng e.V.) was founded in Bonn. Its aim was to teach and to spread Qigong Yangsheng according to the teaching of Prof. Jiao Guorui throughout Germany. As one of the societies’ founding members, I was an active instructor since 1991, being in charge of the formation of course instructors. Since 1991 I also give both weekly and weekend courses for patients with ailments or disorders and for other interested persons. For many years now, I organize 14-day in-depth seminars for intensive training, in Germany and Switzerland alternately. Since 2010 I teach Qigong Yangsheng in my own institute, the Shenjing-Qigong-Institut in Hannover, where I also offer a complete formation for Qigong course instructors and Qigong teachers. Drawing upon a holistic concept, Traditional Chinese Medicine (TCM) naturally features many techniques, both in diagnostics and in therapeutic / prophylactic application, suitable to alleviate and heal ailments. We will take a close look at the influence of water on the condition of our body and soul. Water is one of the 5 Elements, which represent our reality. How is the diversity of water’s qualities integrated into the therapeutic concept of TCM? 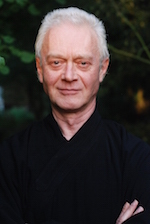 Which connection do the exercises of Qigong have to the water element and how can we approach the realisation of the water’s qualities in our practice? Saturday: Where is the hidden water? There are many different movement routines, but in all of them we can perceive and retrace the nature of water, thereby drawing our therapeutic attention to the elementary qualities of water. In some routines, the powers of the elements are worked with and thus brought into effect it increased intensity. – Working on the „game of the tiger“ from the routine „game of the five animals“, this workshop will explore the nature of water on a deeper level. Michael wrote articles for the German Taiji Forum website. More information you will find on his website.